The news of Hurricane Irene didn’t keep Christina and Steve from getting married and celebrating on Saturday night at the Beautiful Wedding and Event space The Foundry In Long Island City. 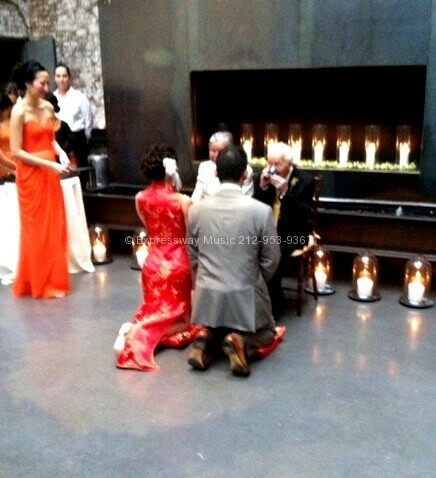 In addition to the Marriage ceremony there was a beautiful Chinese Tea Ceremony where newlyweds are “officially” introduced to each other’s family and tea is served as a way for newlyweds to show respect and appreciation to their parents and elders. 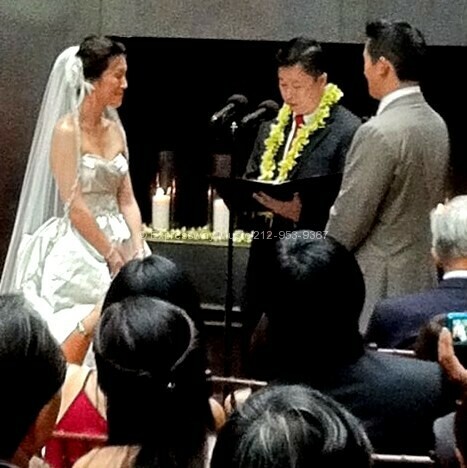 DJ Dave explained the meaning and significance of the Tea Ceremony to guests. There was a montage played throughout the wedding on the large Screen. 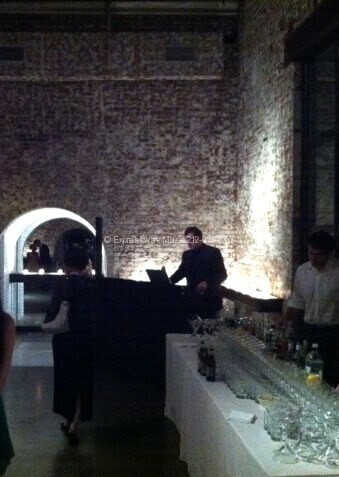 Here is a photo of the best man giving his toast during dinner in the main space. After dinner guests returned to the Greenhouse space for Introductions, first dance, parent dances , the anniversary dance and cake cutting. 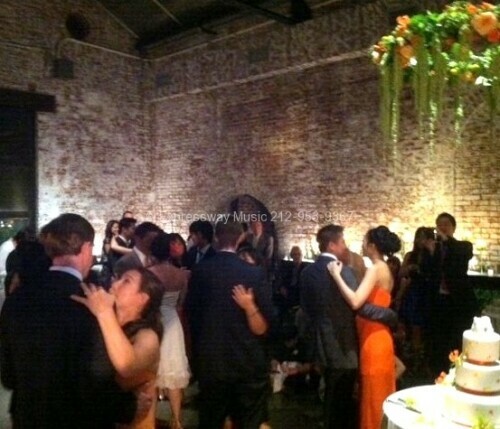 Here is a photo of the bride and groom’s first dance which they practiced with a dance instructor prior to the wedding. 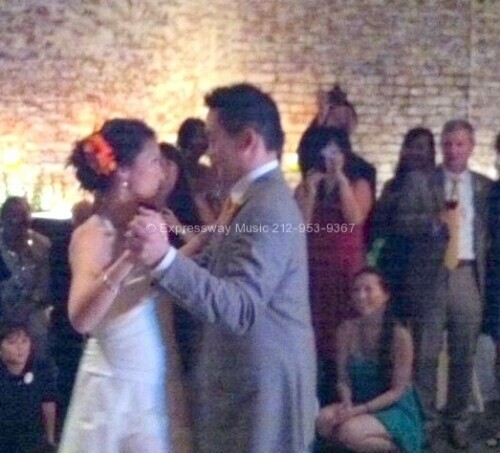 The first dance song was “The way I am” by Ingrid Michaelson. 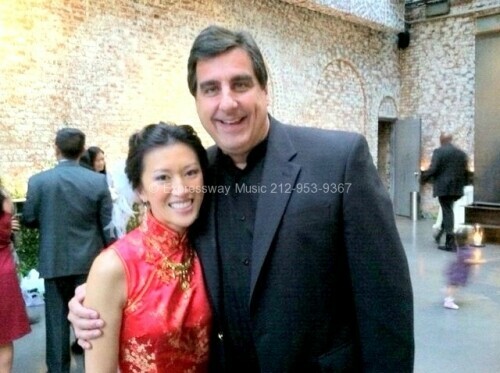 The wedding was catered and conducted by Real Food Catering NYC. Usually DJ Dave would set up in the Foundry’s main space but because of the pending hurricane some logistical changes needed to be made and he set up in the New Greenhouse space..it worked out perfectly. Here is DJ Dave at some point during the party. Many, many thanks to bride and groom Christina and Steven, Yen and Gary from Real Food Catering and Alison and her staff from the Foundry. We wish Christina and Steven a great honeymoon in Costa Rica!!! Thanks so much for the kind words, but it’s really us who should be thanking you for making our wedding day such a memorable and amazing experience that ran so smoothly despite the hurricane! We really were so grateful that you never hesitated to be there even with the hurricane and evacuation zone that was adjacent to the Foundry – that meant so much to us. And on top of all that, we threw so many last minute changes at you with the new set-up and our guitarist who canceled! You never missed a beat and turned a potentially disastrous day into one that we’ll never forget with your positive attitude, dedication, and of course the awesome selection of music throughout the night. We really meant it when we said you’re the best!!!! We still don’t know how we got so lucky with our amazing team of vendors!